We’re getting political at Negotiations Ninja as Dr. Joshua Weiss, a conflict resolution and negotiations expert joins us. Dr. Weiss talks about the current situation in Washington and tensions between Democrats and Republicans. How did we get here in the first place? What are some tactics both parties can employ to diffuse a potential political war as one shutdown ends with a possible state of emergency looming ahead? What is the positional approach to negotiations versus the interest-based approach? What are the best and worst-case scenarios? Is there value in not speaking publicly at all about the negotiations? The Wall issue started in September 2017 when there were a number of proposed deals on the table as part of a “grander bargain”. Democrats believed there was a path forward for DACA recipients to get their citizenship in exchange for border security funding. Long story short, eighteen months later no deal for DACA recipients, no funding for The Wall or other border security funding, the longest government shutdown in U.S. history, and a potential state of emergency if negotiations break down. What’s the best-case scenario? Dr. Weiss argues its no further government shutdowns and a smart plan for immigration reform. Then what’s the worst-case scenario? Another government shutdown, a state of emergency and hundreds of thousands of government workers not getting paid. So what do both parties need to do to make sure the worst-case scenario doesn’t happen? A good first step is for Democrats and Republicans to stop talking about the negotiations. Dr. Weiss argues a halt on negotiating in the press gives much more room for creativity and tangible, effective problem solving going forward. 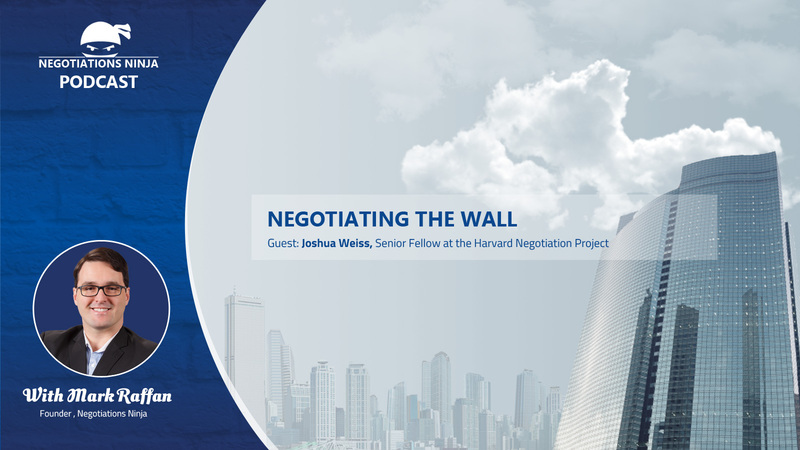 Dr. Joshua N. Weiss is a negotiation and conflict resolution expert, Senior Fellow at the Harvard Negotiation Project and the co-founder of the Global Negotiation Initiative at Harvard University. He is also the Director of the MS in Leadership and Negotiation at Bay Path University. He is also an author of the children’s books Trouble at the Watering Hole: The Adventures of Emo and Chickie. Finally, he has his own private consulting firm where he designs and facilitates customized negotiation and conflict resolution solutions for businesses, organizations, international entities, governments, and individuals.